Last Sunday I went to a Chinese New Year celebration show at the Atlanta Symphony Hall. I'm not sure what I was expecting, but I got eyes and ears full of talented performances. 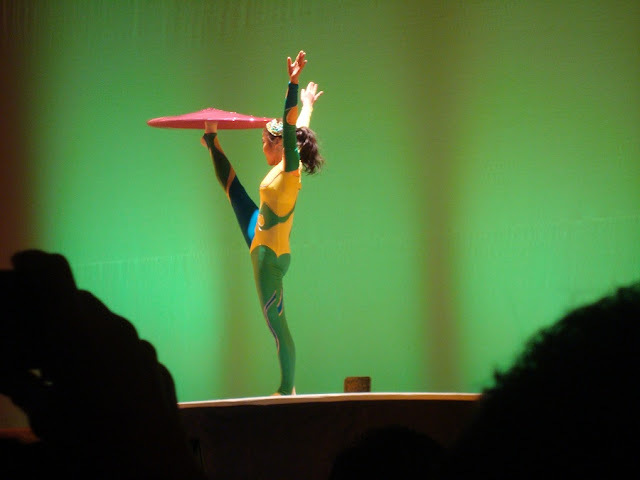 The first two acrobat performances were my favorite with contortionist poses and incredible skill levels. Its exciting to watch! All I could think about was how much time, training and dedication goes into something like this. Ballerinas practice for years before they can dance on their pointed toes alone, let alone balance on a man's head while balancing on one toe! These people are super strong and it must require extensive training to prepare for performances like this one. I'm impressed to say the least. The next acrobat was performing an act known as blanket juggling, which doesn't really sound like much. However, it was incredible and this girl's skill was amazing! I'm literally in awe. Check out the video below and see for yourself. Lu Lingling performs a balancing act using her mouth while juggling blankets. Taken at the Chinese New Year performance in Atlanta, Georgia on 01.16.12. The Year of the Dragon begins on January 23, 2012, which is a New Moon and the day before my birthday...an interesting string of events.